This system features Swanns True Detect PIR Thermal-Sensing technology to reliably detect heat-generating moving objects, such as people, large pets & cars. With more accurate motion detection you have more reliable notifications & recording, eliminating false triggers such as falling leaves, bugs, rain & more, saving you hard drive space & playback time. With 5MP resolution, 2.4x better than 1080p Full HD, you can zoom in closer with incredible clarity to license plates, facial features and clothing patterns.Now its even easier to see what's happening using voice commands via the Google Assistant (using your Smartphone or Google Home) and your Chromecast device. You can customize commands such as Ok google, show me the front door and then stream video from the cameras to your smart TV. Depend on Defender to protect what matters most. Featuring 2K resolution, remote viewing with the free SmartSignal app, and no monthly fees, Defender 2K Wireless gives you hassle free peace of mind, ready to go in three simple steps. Protect what you value most with the Defender PHOENIXM2 wireless plug and play surveillance system. Set up easily in a matter of minutes and record audio/video footage using MPEG-4 compression. Simply connect the cameras to a power supply and experience peace of mind by monitoring your property with 50/50 split screen view. Designed to make security easier than ever before, Defender brings you high performance HD 1080p resolution, ClearVu Smart Signal wireless adaptive technology, remote viewing and two durable wide-angle cameras. Keeping watch so you do not have to. This is what security feels like. EZVIZ home security system features 8-1080p analog bullet cameras that providing a 115.6 viewing angle. The IP66 weatherproof rated cameras work for both indoor and outdoor environments. Record content captured onto the 1TB DVR. Stay connected by live viewing or playback video from your mobile device via the EZVIZ app. Triple-layer security encryption safeguards your videos. Be secure with EZVIZ. 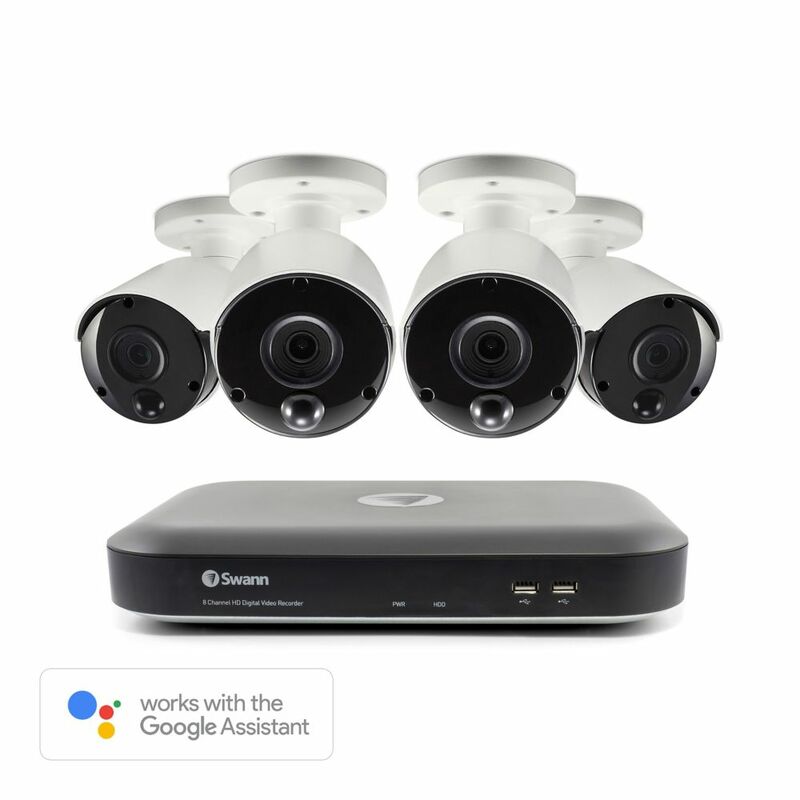 8 Channel 5MP 2TB DVR Security System with 4 Outdoor Thermal-Sensing Bullet Security Cameras This system features Swanns True Detect PIR Thermal-Sensing technology to reliably detect heat-generating moving objects, such as people, large pets & cars. With more accurate motion detection you have more reliable notifications & recording, eliminating false triggers such as falling leaves, bugs, rain & more, saving you hard drive space & playback time. With 5MP resolution, 2.4x better than 1080p Full HD, you can zoom in closer with incredible clarity to license plates, facial features and clothing patterns.Now its even easier to see what's happening using voice commands via the Google Assistant (using your Smartphone or Google Home) and your Chromecast device. You can customize commands such as Ok google, show me the front door and then stream video from the cameras to your smart TV. 8 Channel 5MP 2TB DVR Security System with 4 Outdoor Thermal-Sensing Bullet Security Cameras is rated 4.8 out of 5 by 14. Rated 5 out of 5 by jianzheng l. from very good! very good! Rated 5 out of 5 by Jim H. from Very Satisfied. Very Satisfied. Rated 5 out of 5 by Mark R. from EASY TO INSTALL, FANTASTIC TO EASY TO INSTALL, FANTASTIC TO GET WORKING ON IPHONE ! Rated 5 out of 5 by Linda M. from Great Systen Swan is a quality system, have been through 5 DVR's and this one is the best, easy to get around, easy to play back and download footage. Easy app setup and the quality of both the DVR and Cameras are outstanding. Good job Swan on making an affordable, quality product. fyi, i have sold 2 of these since i purchased mine. Rated 5 out of 5 by Robert A. from Great quality Display I previously had a 720P system and this DVR if far more superior. I had to replaced all my installed BNC cables because some of the automatic functions of the new DVR with the Cameras would not work. I replaced my yellow BNC cables with the blue cables that came with the product. I would recommend this system as the system to own, for price and quality. Rated 5 out of 5 by Joshua R. from Excellent Product Very satisfied. High quality product! Rated 5 out of 5 by anthony n. from Great product Easy to install with common sense.